IELTS test takers make a lot of mistakes that make it hard for them to achieve their target score. These mistakes cause them to get stuck at a band score of 6 when they need a 7. In today’s episode we will talk about the mistakes and how you can make sure that you don’t make these mistakes yourself. By the way, if you searched for “ILETS” or “ILTS” to find this page, remember that it’s IELTS (International English Language Testing System). Now learn about the most common mistakes below! Research the exam: Many people, even general English teachers call it “ILETS” or “ILTS” but it’s “IELTS” and it is administered in most countries around the world. Learn about the exam here and find out where you can book your test. You need to book your exam date well in advance because test centers fill up quickly. Know what to expect on test day: The test day usually looks like this: Listening comes first, then Reading and Writing tests are given. In the afternoon you do your Speaking test. The time between your Writing test and your Speaking test could be one hour or it could be 4 hours and you won’t know until you arrive on test day. You need to have a plan for how to fill that time. Knowing what to expect helps build confidence for exam day. Learn the strategies: There is no magic piece of advice or magic idea that is going to get you to your target score. The only way to increase your IELTS score is to learn simple but powerful strategies that actually work. Make sure you ask your teacher how many of his/her students have achieved their target score before you use his or her strategies. The strategies should provide a system that you can use for each part of the test. They should be a foundation to fall back on. They will help anchor you and will keep your mind clear so that you don’t get taken over by anxiety. Strategies will also help you manage your time well on the IELTS Reading test and the IELTS Writing test. Get a study plan that includes test prep and general fluency building: Most students either do only test practice and don’t improve their general fluency or they do only general fluency and they don’t learn strategies or do test practice. You need to do both. Write out your study plan: Create a chart that details exactly what you will do each day. The activities should be a balance of test practice and general fluency building and should also include enough time to give your mind a rest. If you have 30-60 days to prepare you should expect to spend at 2-3 hours per day, six days per week preparing for the exam. 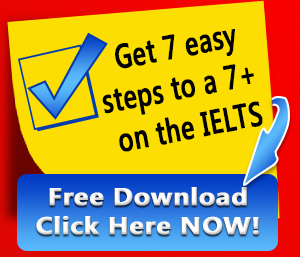 Want to get a 7 or Higher on the IELTS? Click on the link below to download our free IELTS Cheat Sheet. This will give you the exact 7 steps that you need to follow to get on the right path for a 7 or higher. Schedule a deadline: At the time that you get serious about the IELTS, choose a course, and start studying, you also need to set a test date. Why? Deadlines apply pressure that will motivate you to study every day. If you don’t set a test date then you won’t take your commitment seriously. You won’t put in the time that you need. Leave enough time to prepare: You must leave at least thirty days to prepare for your IELTS exam. Thirty days is fine if you are already very advanced in your English level. If you are not advanced and you need to get a 7 or higher then you need to leave at least 3 months to prepare. The best thing you can do is spend a year and the first half of the year is spent focusing on general fluency and then later in the year you can focus on test strategy. Ask about the teacher’s experience and student results: There are many English teachers out there who say they can help you with IELTS but they can’t. When you prepare for IELTS you cannot work with a general conversation teacher. A general conversation teacher does not know the exam and will not teach you the strategies that you need to get your target score. You will waste your time and money. When you consider hiring a teacher, ask about their previous students. What exam results did they get? What strategies did the teacher help them with? Don’t be afraid to question the teacher a bit. This is your future and you are making a significant investment. You need to get results. If the teacher doesn’t have the skills then look for someone new. Are you making any of these IELTS mistakes? Let us know in the comments below and ask us your IELTS questions!